Optimist: "Better to have loved and lost than never to have loved at all"
Pessimist: "Better to not have loved at all than to have loved and lost"
How good can it get: Smooth springy refreshing Jello cubes of different flavors covered with rich cream mousse and spiked with bits of biscuit crumbs and toasted hazelnuts. My son Wey has repeatedly told me to include his favorite jelly dessert, broken glass, as one of my jellies in the Royal Selangor Pewter Jellirific! Challenge so here it is, one of the most refreshing, delicious and fun-to-eat jellies. I've posted a broken glass cake here but looking at how much better the same dessert looks in the shape of the Nick Munro mould, I highly recommend that you get one for your kids' birthday parties and your dinner parties. Think of all the different conical jellies you can make, from a spice centerpiece to an ice cream to a chocolate mousse to two dozens of these broken hearts jellies. When you're not using the mould, it can sit shining prettily on your kitchen window sill. If you purchase one or more this month, you will be contributing to the Breast Cancer Welfare Association of Malaysia, a non-profit organisation that helps women with breast cancer. What a win-win purchase. 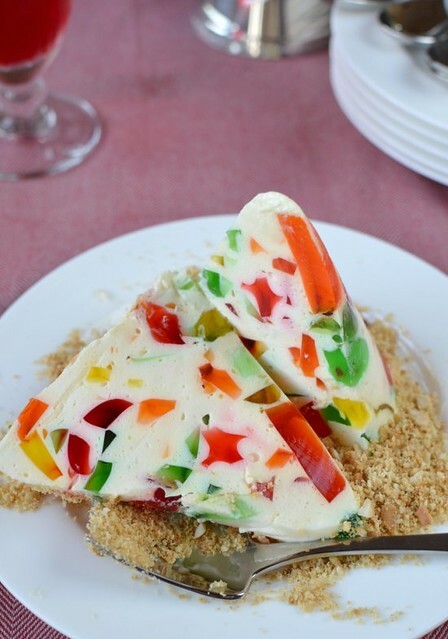 If you haven't eaten broken glass jelly before, you must make one now, today. It is so easy to make that I actually had time to eat lunch out with some friends and their beautiful, sociable 8-month old baby. You just have to make four Jellos of different colors and I do mean Jello, not brands such as Western or Nona because their jellies don't set well. Then whip up the cream mousse, cut the Jello into cubes or stamp them with cutters, mix and scoop into your moulds, preferably the Nick Munro moulds. You can have a bottom layer of crushed Graham crackers (I used McVities digestive biscuits mixed with toasted hazelnuts--yum!) or sprinkle the crushed biscuits around the jelly. You won't believe how super delicious something as simple as that can be. Try it and gush to me about it. I named this jelly 'Broken Hearts' because it was hard to find an intact heart after cutting the jelly. 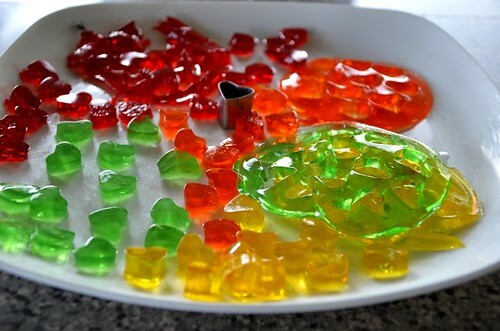 For best results (looks and taste), the more Jello cubes/hearts the better. Garnish: 1 piece of crushed McVities' biscuit and 1 tbsp toasted & chopped hazelnuts. 1. Make Jello of each flavor but reduce the water by about 30% to get a firm jelly. 2. Pour each Jello into a rinsed flat dish so that the thickness is about 0.5 cm. Chill until firm. Cut into desired shapes. The leftover Jello can still be cut and used. 3. Whip the cream with the vanilla until stiff. Chill. 4. Scatter the gelatine powder over the pineapple juice in a small pot and heat until gelatine is dissolved. Remove from heat and add the cold water, stir well. Put into fridge to chill until thickened slightly/slightly syrupy. 5. Mix the gelatine liquid into the whipped cream using a metal spoon and stir in the Jello cubes. Mix thoroughly for a nicer dispersion of the Jello. 6. Scoop into a Nick Munro mould in a mug, cover with wrap and chill until very firm--at least 3 hours. 7. Garnish with grounded Graham crackers or McVites Digestive biscuits and chopped toasted hazelnuts. I don't know why but I really like this jelly the best. On the one hand, it reminds me of a fun clown hat. 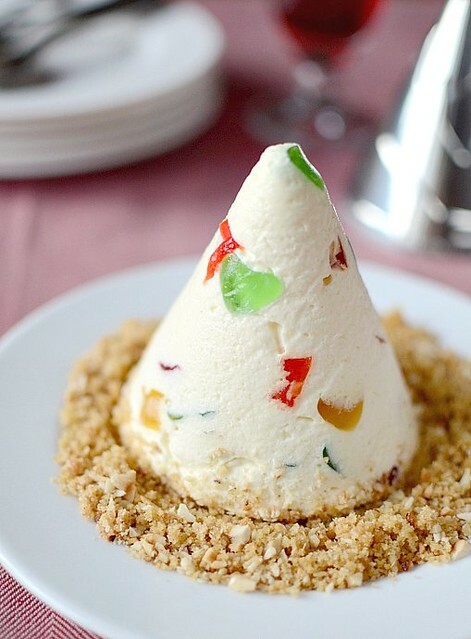 On the other, it makes me think of a de-constructed cheese cake (like in the Top Chef competitions when the contestants are asked to re-think and de-construct regular dishes or comfort food). i've just only looked through all your jelly entries, and i think it'd be a crime if you didn't win! just that sakura jelly alone is a winner. Awww... so cute! Love the combination of flavours and cheese! It's so pretty I want to go and make one right now. (course I can't as I'm stuck at work... LOL) but I feel so inspired to try it soon. Kinda like stained glass as ur son put it. SO pretty...all your jellies are except that some are stunning. You HAVE to win! I can't see it working out any other way. I made Broken Glass before after seeing it in your blog. I will do it again some time soon. I think you ought to win, the perfect photos and recipes show your meticulous planning. The others are not as original, most are predictable, some are downright disgraceful with jellies that are unsightly. Keep it up Terri, we're all rooting for you! yess..where the heart..so beautiful jelly.perfect for kids party. anon: er. tt's a heart? bookwombat: yes it does looklike a clown hat. am thinking of making a jester's hat but how to put it together? martyna: thanks! u still have time to comment?! i haven't read teh news lol! runningbrook: hm, yes, maybe i shd do stained glass, thanks for always encouraging me:)! zurin: if i win, i'll se u in kl! This looks so pretty, I'm tempted to try out this recipe. this reminds me of the nougat Glace with raspberry coulis that hubby made except this looks so vibrant and yummy!! oh, more jello-s? yay! ;) love it even more now. you made it another time didnt you? perfect! 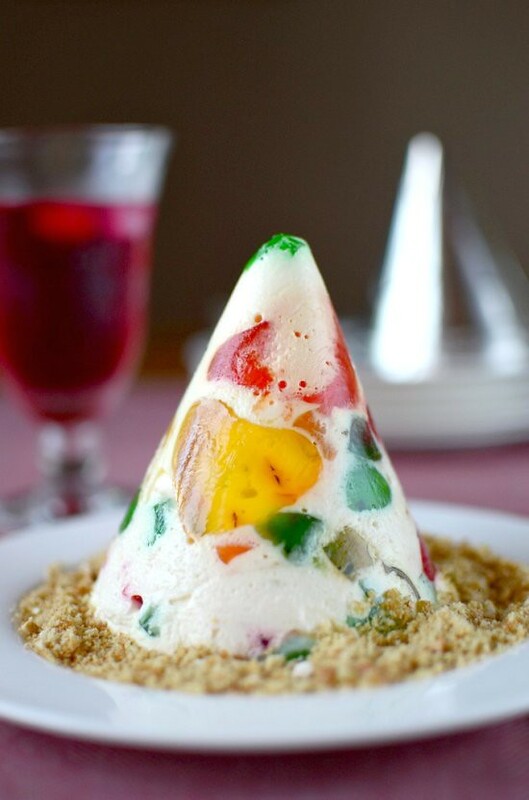 Yes, I can see the engineering dilemma in constructing a jester's hat jelly cone. Not an easy feat to get the tails to curve outwards instead of straight up. Aiyoh! my heart very broken O, coz I can't taste any of your magical jellies! Another brilliant one, Terri. Looks very good, the colors make it looks so delicious.